A 6,387 metre exploration drill program was carried out in 2011 comprising 31 holes. The assay results from this drilling program were released on January 17, 2012. The new discovery zone, now named the Full Moon prospect, has been tested by 31 diamond drill holes over a strike length of 6.5 kilometres and a horizontal width of up to 2.8 kilometres. The vertical thickness of the new zone increases to the east from 50 metres to 341 metres and remains open along strike. The 2012 winter program which began in February 2012 has resulted in 10,337 metres being drilled comprising 41 holes to date, intercepting 7,268 metres of moderate to strongly magnetic mineralized zones. We expect to release the assay results of these holes in the next two months. The winter drilling program extended the strike length to approximately 9 kilometres. Iron formation dips east at 0 to 10 degrees. True thickness is estimated at 95% core length. A mineral resource has not been estimated for the deposit. We are continuing our current exploration program and expect to drill over 5,000 metres in the next two months. The results of the 2012 drilling program will be used to provide an initial National Instrument 43-101 compliant resource estimate. Sandy Chim, President and CEO of Century Iron commented: "I am pleased with the progress of the drilling to date. So far, with over 16,000 metres of drilling, this has extended the strike length of the mineralized iron formation to approximately 9 kilometres. Due to its thickness, width and strike length, the Full Moon project has the potential of being one of the largest single taconite deposits in Canada. Mining taconite, is relatively new in Canada, but it has been the main staple of the US steel industry. Roughly half of the blast furnaces in the US use pellets from the taconite like Mesabi Iron Range (Minnesota) and Marquette Iron Range (Michigan). The evolution of the US iron ore industry model is a good reflection of how taconite can be a high volume long term sustainable supply of iron ore. The Canadian Labrador Trough is a classic text book example of such taconite formation on a very large scale." The Qualified Persons on the project, as defined under National Instrument 43-101, are Claude Britt, P. Geo. and Etienne Forbes, P. Geo. They are responsible for the preparation of all technical information provided in this press release and have reviewed and approved the technical contents of this news release. 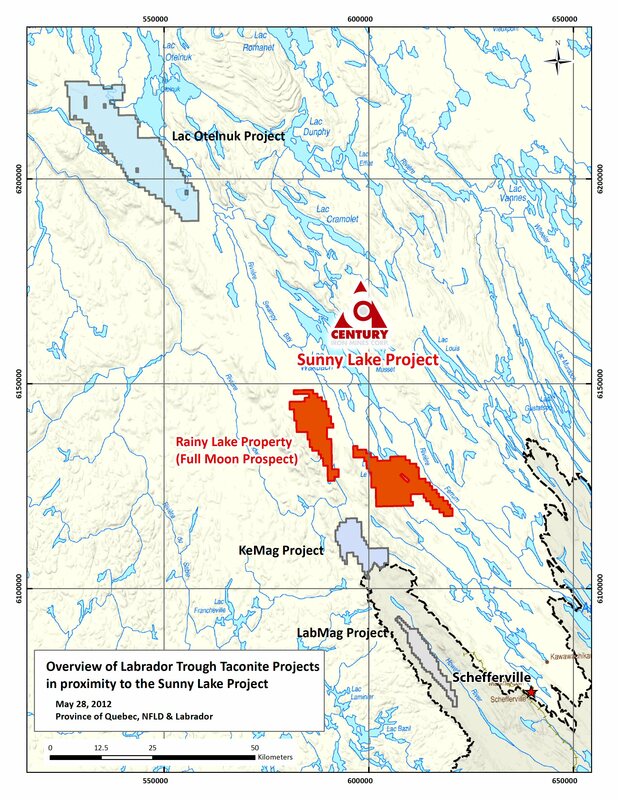 The Sunny Lake Iron Project includes two separate group of claims (Lac Le Fer and Rainy Lake) comprising 335 and 195 designated cells covering an aggregate area of approximately 25,692 hectares. It was acquired in 2009 by staking for its potential to host iron mineralization. The Lac Le Fer and Rainy Lake properties are located respectively sixty-five and eighty-five kilometres northwest of the town of Schefferville, Quebec and are accessible by air. Under the terms of definitive joint venture agreements signed with WISCO International Resources Development & Investment Limited ('WISCO') announced in December, 2011, as a key strategic partner, WISCO has a 40% interest in the Sunny Lake Project pursuant to which WISCO will invest $40 million. Under the terms of the joint venture agreements WISCO has a right of first refusal to purchase up to 40% of the production attributable to the joint venture company at cost and a right to purchase an additional 20% of production at market. Century Iron Mines Corporation (TSX:FER) is Canada's largest holder of iron ore land claims, with interests in several properties in the Provinces of Quebec and Newfoundland and Labrador. Century's mission is to enhance shareholder value through the development of iron ore projects in Canada and to become a major Canadian iron ore producer. Century has promising iron ore assets and is firmly entrenched in western Quebec and in the prolific iron ore-producing region of the Labrador Trough in eastern Quebec and western Labrador. The Company has two key strategic partners in WISCO International Resources Development & Investment Limited and Minmetals Exploration & Development (Luxembourg) Limited S.àr.l., both state-owned Chinese companies with the financial and technical resources to assist the Company with funding and technical expertise for the exploration and development of its iron ore projects. The Astray, Grenville, Menihek and Schefferville projects recently acquired from Altius Minerals Corp. (TSX:ALS) (100% owned by Century Iron). The Company's objective is to enhance shareholder value through the development of iron ore projects in Canada and to become a Canadian iron ore producer. Century Iron's website is: www.centuryiron.com. This press release contains forward-looking statements and information that are based on the beliefs of management and reflect the Company's current expectations. When used in this press release, the words "estimate", "project", "belief", "anticipate", "intend", "expect", "plan", "predict", "may" or "should" and the negative of these words or such variations thereon or comparable terminology are intended to identify forward-looking statements and information. The forward-looking statements and information in this press release includes information relating to the expected completion of the current drilling phase at Rainy Lake and the Company's objective to enhance shareholder value through the development of iron ore projects in Canada and to become a major Canadian iron ore producer. The forward-looking information is based on certain assumptions, which could change materially in the future, including the assumption that the Company is able to complete the current phase III an extension to the Phase II drilling program and that the development of the Company's iron ore projects will enhance shareholder value and be sufficient for it to become a major Canadian iron ore producer. Such statements and information reflect the current view of the Company with respect to risks and uncertainties that may cause actual results to differ materially from those contemplated in those forward-looking statements and information. By their nature, forward-looking statements involve known and unknown risks, uncertainties and other factors which may cause our actual results, performance or achievements, or other future events, to be materially different from any future results, performance or achievements expressed or implied by such forward-looking statements. Such factors include, among others, the risk that the current drilling program at Rainy Lake may be delayed or may not be completed and that the Company's Canadian iron ore projects may not succeed in enhancing shareholder value or allow the Company to become a major Canadian iron ore producer. The Company cautions that the foregoing list of material factors is not exhaustive. When relying on the Company's forward-looking statements and information to make decisions, investors and others should carefully consider the foregoing factors and other uncertainties and potential events. The Company has assumed a certain progression, which may not be realized. It has also assumed that the material factors referred to above will not cause such forward-looking statements and information to differ materially from actual results or events. However, the list of these factors is not exhaustive and is subject to change and there can be no assurance that such assumptions will reflect the actual outcome of such items or factors. 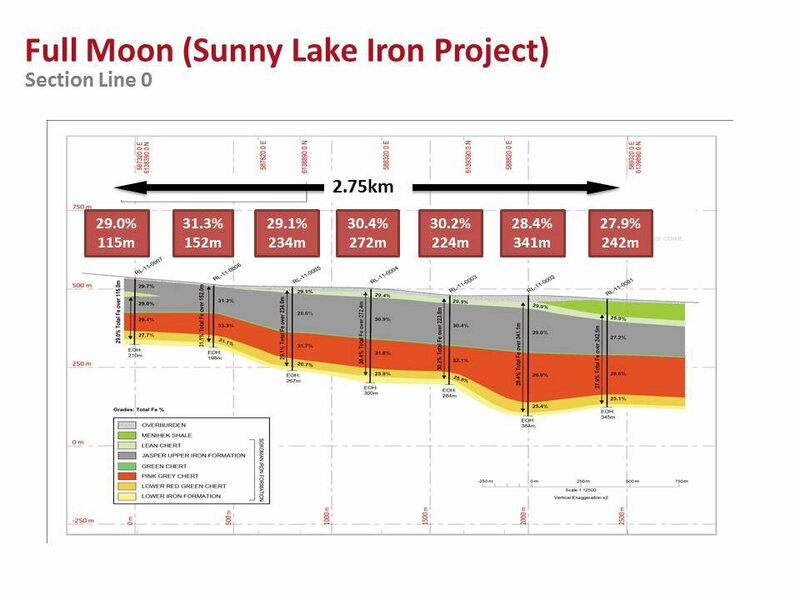 To view the Full Moon (Sunny Lake Iron Project), please visit the following link: http://media3.marketwire.com/docs/FER-FullMoon.jpg. 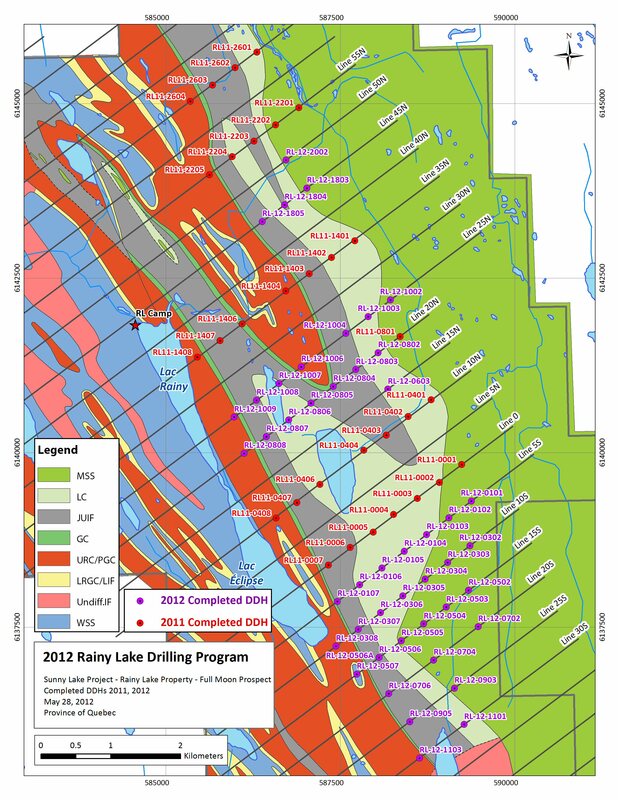 To view the 2012 Rainy Lake Drilling Program, please visit the following link: http://media3.marketwire.com/docs/FER-RainyLake.jpg. To view the Overview of Labrador Trough Taconite Projects, please visit the following link: http://media3.marketwire.com/docs/FER-Overview.jpg.